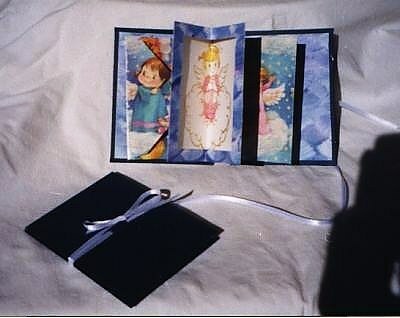 Design: 3½" by 4½", semi-accordion two-envelope book with rubber stamped design insert and ribbon closure. Paste Paper: Ross Art Paste with watercolors. Papers: mulbery paper, gift wrap bonded to copy machine paper. Rubber stamp by Art Impressions; Double Delight thermography powder; watercolor pencils. Text: Mitchell 2¾ nib and roller ball pen, copied at 50%. Adhesives: Yes glue, Alene's Tacky Glue, 3M Spray Mount. See her artist book in the 2nd Callig Book Swap.